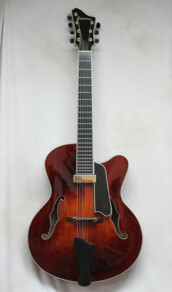 Old-World craftsmanship creates a new jazz standard - with seven strings!. Carved spruce top, carved maple back and sides with Ebony bridge, tailpiece, pickguard and fretboard. Classic Venetian cutaway, floating pickup design. Body Dimensions: 17? X 3 1/8?